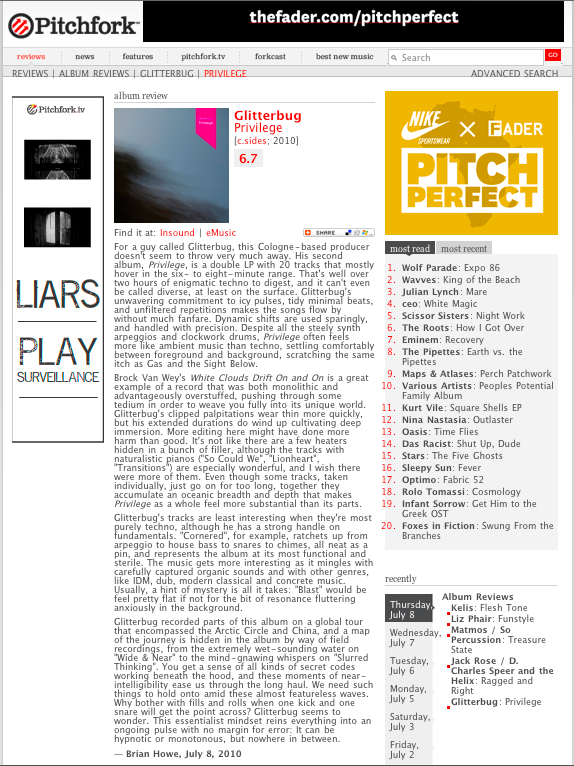 glitterbug» Blog Archive » Review in Pitchfork! 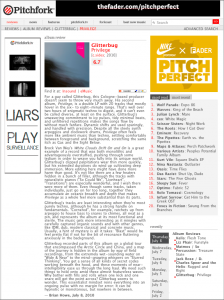 Hmm, a bit of a strange review- but hey, it’s in Pitchfork! For a guy called Glitterbug, this Cologne-based producer doesn’t seem to throw very much away. His second album, Privilege, is a double LP with 20 tracks that mostly hover in the six- to eight-minute range. That’s well over two hours of enigmatic techno to digest, and it can’t even be called diverse, at least on the surface. Glitterbug’s unwavering commitment to icy pulses, tidy minimal beats, and unfiltered repetitions makes the songs flow by without much fanfare. Dynamic shifts are used sparingly, and handled with precision. Despite all the steely synth arpeggios and clockwork drums, Privilege often feels more like ambient music than techno, settling comfortably between foreground and background, scratching the same itch as Gas and the Sight Below. Brock Van Wey’s White Clouds Drift On and On is a great example of a record that was both monolithic and advantageously overstuffed, pushing through some tedium in order to weave you fully into its unique world. Glitterbug’s clipped palpitations wear thin more quickly, but his extended durations do wind up cultivating deep immersion. More editing here might have done more harm than good. It’s not like there are a few heaters hidden in a bunch of filler, although the tracks with naturalistic pianos (“So Could We”, “Lionheart”, “Transitions”) are especially wonderful, and I wish there were more of them. Even though some tracks, taken individually, just go on for too long, together they accumulate an oceanic breadth and depth that makes Privilege as a whole feel more substantial than its parts. Glitterbug’s tracks are least interesting when they’re most purely techno, although he has a strong handle on fundamentals. “Cornered”, for example, ratchets up from arpeggio to house bass to snares to chimes, all neat as a pin, and represents the album at its most functional and sterile. The music gets more interesting as it mingles with carefully captured organic sounds and with other genres, like IDM, dub, modern classical and concrete music. Usually, a hint of mystery is all it takes: “Blast” would be feel pretty flat if not for the bit of resonance fluttering anxiously in the background. Glitterbug recorded parts of this album on a global tour that encompassed the Arctic Circle and China, and a map of the journey is hidden in the album by way of field recordings, from the extremely wet-sounding water on “Wide & Near” to the mind-gnawing whispers on “Slurred Thinking”. You get a sense of all kinds of secret codes working beneath the hood, and these moments of near-intelligibility ease us through the long haul. We need such things to hold onto amid these almost featureless waves. Why bother with fills and rolls when one kick and one snare will get the point across? Glitterbug seems to wonder. This essentialist mindset reins everything into an ongoing pulse with no margin for error: It can be hypnotic or monotonous, but nowhere in between. This entry was posted on Thursday, July 8th, 2010 at 4:47 pm and is filed under Press / Reviews. You can follow any responses to this entry through the RSS 2.0 feed. Responses are currently closed, but you can trackback from your own site.